Georgia's Home Inspirations: Basil Pesto Presto! I just plucked the last of my basil out of the garden and decided to end the season with a pesto. My go to recipe comes from Mario Batali and is made with two cheeses, Parmigiano-Reggiano and pecorino romano, for depth of flavor. Additionally, the pecorino melts nicely. This recipe is quick, easy and oh so delicious! Give it a try and, if you get to New York City, don't miss OTTO Enoteca Pizzeria in the West Village, Batali's casual Italian restaurant offering affordable dishes and great wine! 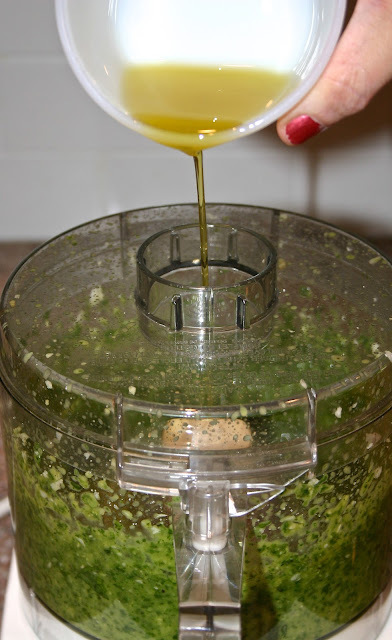 Put the garlic into a food processor to chop it. Add the basil, pine nuts and salt and process until finely chopped. With the motor running, drizzle in the olive oil. Transfer mixture to a bowl and stir in the cheeses.